Many fantasize about dramatically changing their lives -- living in accordance with their ideals rather than the exigencies of job, bills, and possessions. William Powers actually does it. In his book Twelve by Twelve, Powers lived in an off-grid tiny house in rural North Carolina. In New Slow City, he and his wife, Melissa, inhabited a Manhattan micro-apartment in search of slow in the fastest city in the world. Here, the couple, with baby in tow, search for balance, community, and happiness in a small town in Bolivia. They build an adobe house, plant a prolific orchard and organic garden, and weave their life into a community of permaculturists, bio-builders, artists, and creative businesspeople. Can this Transition Town succeed in the face of encroaching North American capitalism, and can Powers and the other settlers find the balance they're seeking? 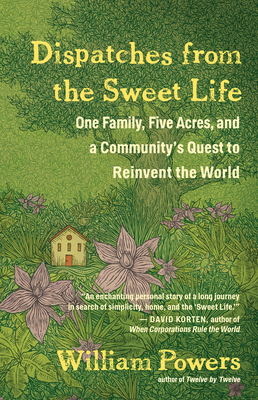 Dispatches from the Sweet Life is compelling, sobering, thought-provoking, and, no matter the outcome, inspiring. An author, speaker, and expert on sustainable development, William Powers is a senior fellow at the World Policy Institute and an adjunct faculty member at New York University.